Late in 1957 a significant departure was made from the format of the preceding era when a completely different design was introduced. The style – a predominantly silver box - was used for the next 45 years with a number of ongoing changes in the style. In the interior of the box, the corrugated cardboard spacers of earlier boxes were replaced with Styrofoam which was molded to surround the body, magazine and lens of the newly introduced 500C camera. 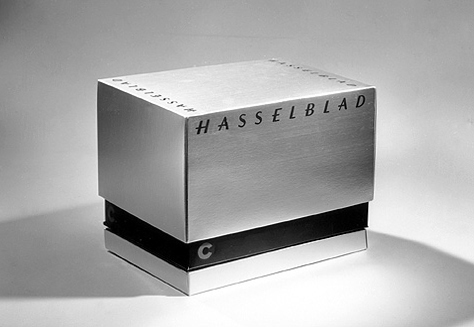 The silver box had “Hasselblad” in stylized italic logo script letters on the two long sides near the top with nothing but silver on the ends. The black base of the box has a blue C in the left hand corner on all four sides. A spacer on the bottom of the box was also provided – the purpose of which is unclear. A factory black and white photo is shown below. The non-corrugated cardboard back of the interior box was extended to fit over the top and down the front. In the closed box position it protected the celluloid box-like protector that fit over the Styrofoam. This extension of the back had “Hasselblad” in a central turquoise circle and could be folded such that it became a display / advertising package. 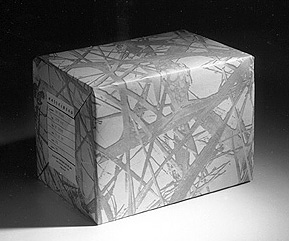 This first version box had a 500C silver covered instruction book resting on top of the Styrofoam inside a molded space. At one end of this space there was a smaller deeper compartment molded-in to accommodate a folded neck strap. 500 C box type 1. The corrugated outer sleeve of prior years was replaced with thin, buff colored wrapping paper. A pattern of straight and bent reed stems and leaves was printed onto the buff paper grading in color from buff to medium brown. One end had a 68 by 90mm light buff label pasted permanently in place. 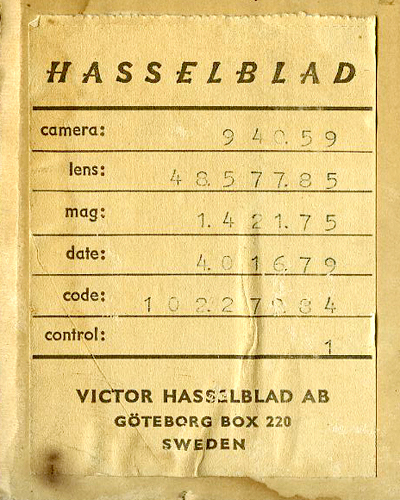 The label had the contents information indicating the camera, lens and magazine back serial numbers and a date – presumably the scheduled shipping date or order date or packing date. These early boxes printed the date on the label without coding it. Labels on later boxes coded the date entry -- see details below. It is not known how late this style of box and wrapping were used – likely only late 1957, 1958 and perhaps 1959? It was a very complex (and likely expensive) packaging to be used. 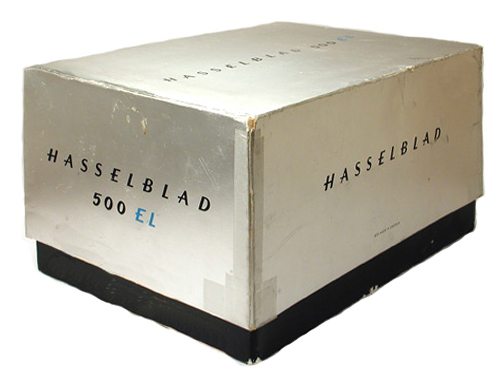 By 1960 the silver 500C box had evolved to having the Hasselblad script logo on the end and sides of the top box slightly above the centerline. 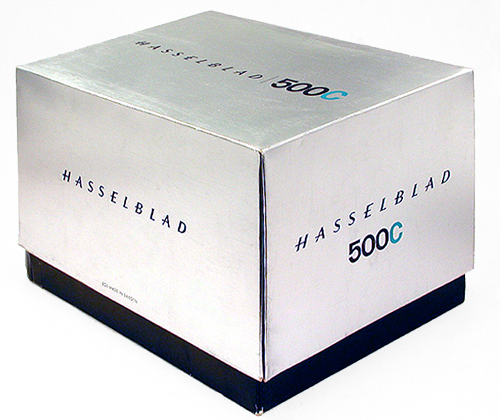 Just below the Hasselblad printing on the ends there was “500” in black followed by an aquamarine C. The code for the 500C kit (AKFEM) was also printed on the bottom of the silver top box. The top had a single Hasselblad inscription lengthwise down the middle followed by a short vertical black separator line followed by 5oo C (the zeroes are smaller than the 5, the C is blue). Inside the Styrofoam casing was somewhat simplified from the Type 1, by lacking moldings in the top for the neck strap and the silver cover Instruction Book. The neck strap now went inside the Styrofoam in a rectangular cavity and the instruction book rested on top. A shipping label was glued to an outer cardboard sleeve that protected the silver box. The outer sleeve had a variety of interesting information printed on it. 500 C box type 2. Cavities for strap and instruction book on top of the Styrofoam padding. About 1962 the silver box styling was changed slightly again. The printing is different from the Type 2 in that for the 500C the font size for the 500 and C are the same – but with the “C” still being turquoise blue in color but the “500” script is “open” or “hollow”. This box was in use from 1962 to about 1966. 500 C box type 3. In about 1966 there was another minor style change in the now familiar silver box. The key difference is with the 500C style with the script being solid black followed by the turquoise "C". This box style was used up to 1970 when the 500C/M was introduced and a change in the printing was necessary. It would be expected that there would be some 500C/M cameras delivered in 500C boxes until the stock of 500C boxes were used up. The factory was quite frugal – there are many examples of this including using the 500C labels on the accessory rail of the 500C/M body until they were used up! One variation in the box is that a silver label / sticker was added to the Type 4 box with the introduction of the A12 film magazine in 1968 a small additional sticker was put on camera boxes delivered from 1968 to 1970. The outer box or sleeve during this period was still the corrugated cardboard sleeve with a glued label with serial numbers and delivery date on them. The photo shown below is a 500C from 1969. The boxes (both inner and outer) have stickers on them indicating that the magazine is the newly introduced A12 type. 500 C box type 4. Additional stickers on inner and outer boxes indicate the presence of a magazine with automatic features inside. Some mention has been made earlier of the shipping label on the boxes from the 1960’s and an example is shown to the right. The serial numbers are obvious except for the confusing decimal places. The camera in this box was 94059. The year code (TE in this case) is not included. Similarly the film magazine (A12 TE 142175) has no year code. The lens is an 80 mm silver Planar also assembled in 1969. The date printed is a bit more complicated. The date is coded. It is 6 numerals in a DDMMYY format but each of the day and month and year must have the numeral 10 subtracted from them to provide the date that was coded on the box. So for the example to the left, 401679 really means 300669 or the 30th of June 1969. Presumably this is a shipping date or order date or packing date – a reasonable estimate when the camera left the factory. There is also an 8 digit code listed which I have yet to decipher. Suggestions gratefully received! It appears to include information on the country (the first three digits I’ve seen most often is 102 and may mean USA) and the following five digits may simply be an order number? A box of a very different design from the silver 500C box was used with the SWC when it was introduced in 1959. 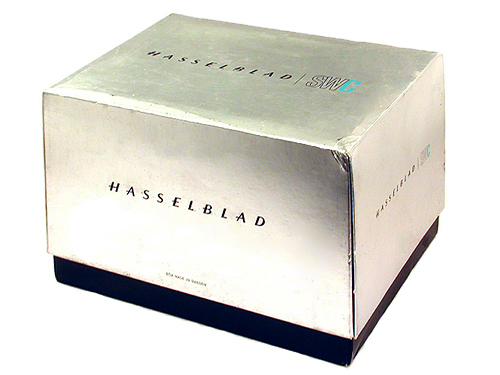 It is a blue and gray box with Hasselblad logo and Super Wide C displayed. The Instruction book has a matching color scheme. Two printings of this instruction book are known with dates of 1959 and 1961. This style of box seems to have been used up to 1965 when the style that was used for the 500C from 1962 was introduced for the SWC. This may be another instance where the factory wanted to use up existing stocks of boxes before printing new boxes for the SWC. The blue/gray instruction books appear to have been used to 1969 since the familiar silver cover version of the instruction book did not appear until 1970 (according to what is presently known). Super Wide C instruction book included in type 1 box. The examples examined (there don’t seem to be very many early SWC boxes that have survived) have no internal corrugated support for the sides or top of the camera. It is assumed that it was initially included - specifically to hold the camera body in place and to provide a repository for the viewfinder, which had to be removed from the camera body before storing both body and finder in the box. Type 2 – 1965 - 1969? The silver SWC box seems to have been introduced around 1965 and was the style of the 500C box in use during that time with the SW of SWC being open script lettering and C being turquoise blue. This style of box seems to have been used through 1969, perhaps as late as 1972. Text and photos copyright 2011 - Rick Nordin and Charlie Chernoff. All rights reserved.